Will State DOTs Follow Through on Their Goals for Zero Traffic Deaths? State DOTs aren’t known for setting ambitious street safety goals. They’re usually more interested in moving traffic than saving lives. But it looks like that’s starting to change as states follow the lead of the federal government’s “Toward Zero Deaths” initiative, which itself was inspired by the spread of Vision Zero campaigns among cities. Even states like Ohio are saying their goal is zero traffic deaths. This is a new development and the jury is still out on these campaigns. Many agencies seem to be counting on self-driving vehicles to come to the rescue instead of committing serious resources to proven measures like street redesigns to calm traffic. But others appear to be taking the responsibility to ensure public safety a lot more seriously. The plan never refers specifically to “vision zero” — the moniker adopted by 21 cities nationwide (including Portland) — but it unequivocally states that the Oregon Department of Transportation will work toward zero deaths by 2035. This is a significant shift since 2011. The new plan mentions “zero” in regard to fatalities and injuries over 30 times. The 2011 plan mentioned it only twice. We also like the urgency in statements like this: “The development of the [plan] is an important step toward continuously changing the traffic safety culture in Oregon. 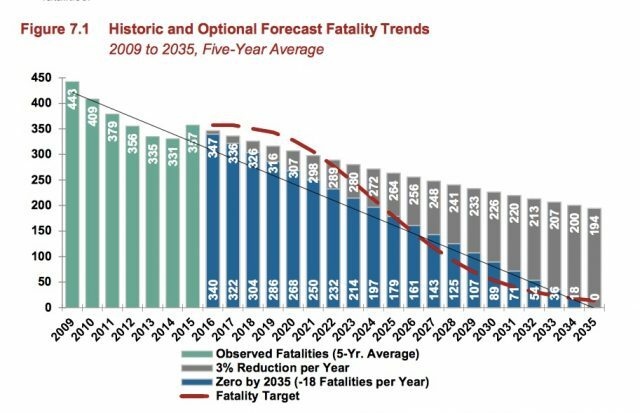 It comes at a pivotal time as it is imperative to counteract the recent fatality increase.” It’s encouraging to see that ODOT is not ignoring the sobering spike in fatalities. Good stuff, but will Oregon DOT follow through? Maus notes that the specific recommendations for bike safety, for instance, aren’t very exciting. Elsewhere on the Network today: Cap’n Transit argues that attaching cheap parking to a transit or bike project can ruin the whole thing. And The Urbanist draws some conclusions from Uber’s endorsement of the big $53 billion light rail measure in Seattle. Portland Gearing Up for Vision Zero. Will Oregon DOT Cooperate?